Cystopteris fragilis (L. ) Bernh. Culms: Stems are rhizomes, creeping, usually less than 6 inches, densely scaly; scales broadly lanceolate, tips long-pointed. Leaves: Usually borne in small cluster at tip of rhizome; stalk 1.6 to 10.8 inches long, green or straw-colored; blade 1-2-pinnate-pinnatifid, lanceolate to narrowly elliptic, 3 to 16 inches long, .8 to 4.2 inches wide, widest at or just below middle, glabrous or sparsely glandular, outline of blade tapering to pointed tip; pinnae (primary divisions) in 8-18 pairs, upper pairs gradually reduced, lowest pair equaling or smaller than next lowest pair, pinnae nearly opposite to alternate, usually perpendicular to rachis, narrowly triangular to narrowly ovate or lanceolate, .4 to 3 inches long, .2 to 1.2 inch wide; ultimate segments broadly ovate to oblong or elliptic; margins toothed; teeth slightly rounded; veins running to marginal teeth; tip pointed or blunt; sori discrete, round, borne on undersurface of segments; spores dark brown. 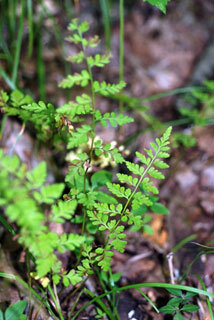 Habitat: Moist wooded hillsides, ledges, stream banks; rich soil. Uses: The Navajo used a compound infusion of the plant as a lotion for injuries.